Rick Saitta, left, of New Milford, talks with New Milford Mayor Pete Bass. Saitta said he wanted to “come down and see what people have to say”. NEW MILFORD — Over the first two months he’s been in office, Mayor Pete Bass’ spot in the E. Paul Martin meeting room has normally been behind the desk, presiding over Town Council meetings. But on Saturday morning, Bass spent his time in front of the tables, chatting with residents in the first “Coffee with the Mayor” event since he was elected in November. He invited residents, in what he hopes will become a monthly tradition, to drop in for coffee and doughnuts and let him know what is on their minds. He said he hopes to continue holding the event on weekends to give those busy during normal Town Hall hours a chance to stop by. 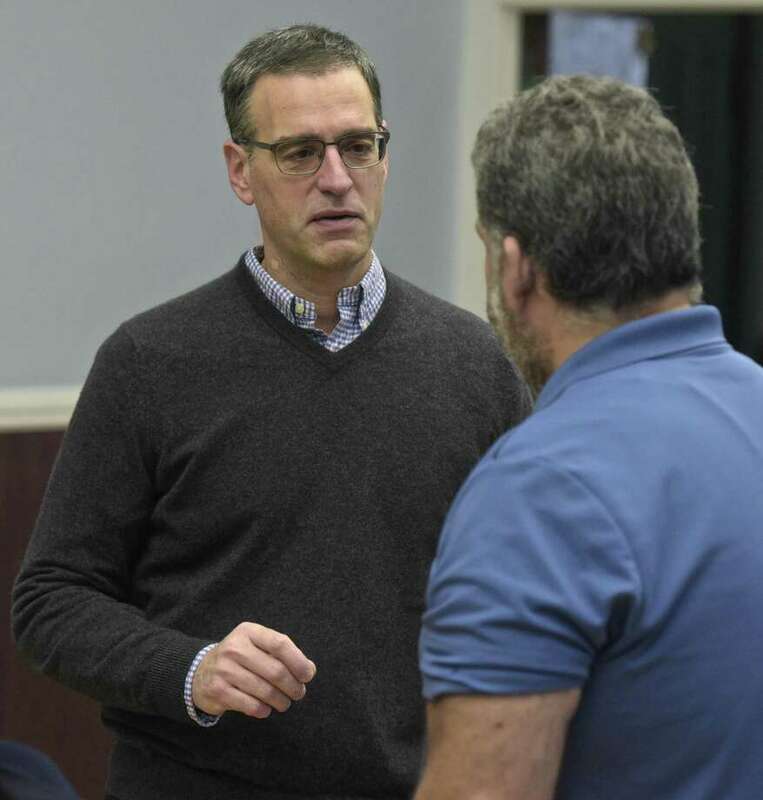 The few dozen residents who filtered in and out of the Town Hall room Saturday brought up “the whole gamut” of topics, Bass said, but most popular were the state of town roads, the budget and some weather-related concerns. Some questions Bass was able to answer on the spot, but for those he needed to look into, he made sure to take notes. “I have my notepad over there, so some things they want me to follow up on, I’ll write it down,” he said. The issues most on resident Steve Confortini’s mind Saturday were the budget and how Bass’ administration will handle the former John Pettibone School. Confortini said former Mayor David Gronbach spent too much money converting the building into a community center. Confortini said, so far, Bass has done a good job listening to concerns he and other residents have brought up. Saturday’s event was just one of the ways the new mayor has made Town Hall more accessible to the public, he said. Simple changes like moving the Town Council tables to face the public and giving a microphone to those speaking during public comment has made a difference during meetings, Confortini said. Resident Paul Murphy said Bass’ openness was one of the reasons he voted for him in November. “When you meet Pete for the first time, it’s almost like you meet the man and he’s been your friend forever,” Murphy said.